Versailles Poultry Days will be celebrating its 67th festival Friday, Saturday, and Sunday- June 14th, 15th, & 16th, 2018. We would like to invite you to participate in the commercial/craft tent. We provide several options for you. We provide a large tent divided into 10’ by 10’ booth spaces, or you can provide your own tent with several booth size options. All 10x10 spaces are available on asphalt, while the 15x15 spaces are available on either asphalt or grass. 10x10 ft. booths inside our Vendor Tent are $85 if you send your payment and application by March 15th. · 10x10 ft. booths inside our Vendor Tent are $100 for the first booth and $50 for each additional booth space (after March 15th). 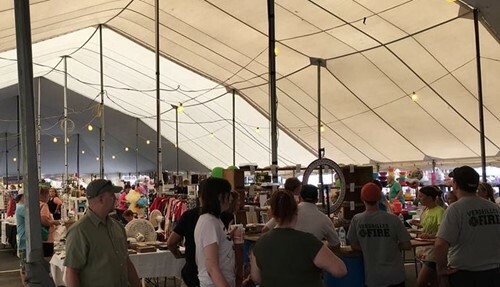 · 15x15 ft. location outside of the vendor tent (you provide tent) $110 each/$75 for each additional space...2 spaces would give you 30’ frontage by 15’ depth. Could be on asphalt or grass. · Call if you need additional space. You must bring your own displays, tables, and extension cords for all spaces. Standard electrical outlets are provided. However, please let us know if you have any special electrical needs. Interior display heights are subject to restrictions to avoid damage to the tent. If needed, two local tent rental companies are Reliable Tent, 877-925-8368 and GT Wolf Tent Company, 937-548-4161. Again, 15x15 spaces are available on either asphalt or grass. You may request a space on asphalt or grass, and we will try to accommodate, however we will fill these spaces on a first come first serve basis. Registration will remain open until noon on Friday, June 8, 2019 or until all spaces are full.